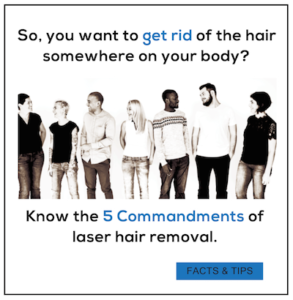 Do you know the 5 Commandments of Laser Hair Removal? Get our free e-book with useful facts and insider tips about laser hair removal before you sign on the dotted line or hand over your hard earned money. Download now! Considering Laser to Treat Unwanted Body Hair? Or, have you tried it and not been thrilled with the results? The fact is, laser hair removal is not the ideal solution for everyone. We know the key factors that make treating unwanted body hair successful for our patients. First: The quality and type of equipment used. Second: The experience level of the clinician treating you. Third and most important: Honesty about what kind of results you can expect, based on your hair’s reaction to laser in conjunction with your skin type and tone. You may or may not be a good candidate for laser hair removal. If you aren’t, don’t worry, there are alternatives. Factors such as age, ethnicity, medications, and hormone levels influence our body’s hair appearance. These factors affect the length, coarseness, and color of our body hair. Laser technology offers a permanent and safe solution to eliminating or reducing unwanted or excessive hair. We use the most advanced laser systems from Lumenis™, a pioneer in the field of laser aesthetics, and highly-respected in the medical industry worldwide for quality and effectiveness in treating unwanted hair across the hair and skin tone spectrum. 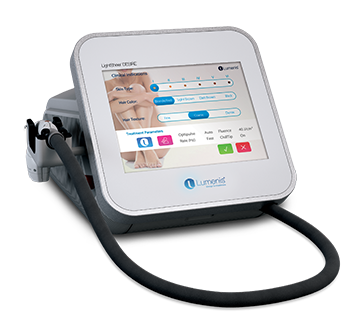 Our suite of lasers include the Lumenis™ Lightsheer Diode and the Lumenis™ DESIRE with vacuum assisted high-speed integrated technology (HIT™). This technology allows patients to experience minimal discomfort. DESIRE was awarded the Core 77 design award for commercial equipment. These Class 4 medical devices from Lumenis deliver the best results in removing unwanted hair. We do not use IPL (pulsed light-based device) for hair removal, as we do not believe this technology is best suited for the treatment of removing unwanted hair and permanently eliminate chronic ingrown hairs. Additionally, we can treat all skin types. Over the past 20 years – since this technology became available to consumers for cosmetic purposes – we have successfully treated more than 10,000 patients for unwanted body hair. Essentially Bare treats men and woman, all body parts and skin types. A complimentary consultation is required to determine whether or not you are a good candidate for laser hair removal. If the hair is too fair and there is not enough contrast between the hair and skin pigment, laser will not be effective in eliminating unwanted hair. Darker hair on darker skin tones can be treated with our lasers, but with realistic expectation that the hair will be reduced, not eliminated. Hair may grow back more slowly, and laser can successfully treat folliculitis barbae. Over the years, we have seen many patients who were either treated with the wrong or substandard equipment (IPL or equipment from unknown manufacturers), or the medspa under-treated the patient. In many cases, re-treatment is successful. However, if the hair is thinned (indicating too many sessions at too low of a fluence), permanent elimination no longer possible. In these cases, we recommend using electrolysis to treat the fine hairs. Electrolysis is offered in our Cambridge office, and through our affiliate offices. We also offer dermaplaning for very fine facial hair growth. Before you sign on for “unlimited treatments” or big, discounted packages, call us. No one can predict how many treatments will be required to eliminate your unwanted hair. Everyone reacts differently to laser treatments. Because of this we do not presell unlimited or volume packages. We may offer you a discounted price for 3 treatments. This is the average number of sessions our patients require to see substantial hair reduction results. We follow this with further discounts based on a case-by-case basis. Our goal is to treat you quickly and effectively. Many of our patients return to us to treat other areas for laser hair removal or for our advanced skin services. We want satisfied clients, and rely on you for referrals and positive word of mouth, as a locally-owned and operated business. Electrolysis has been used for decades, and is effective for light and thin hair. And, for patients who only have a few hairs that they want to eliminate. Using an electrically charged, tiny needle, each hair follicle is specifically targeted several times to permanently eliminate regrowth. We often use this for stragglers post-laser, or on fine hair areas such as lip and chin and underarm. Electrolysis offers a cost-effective alternative to laser or the best solution to target these unwanted hairs. Dermaplaning does not permanently remove hair, but it is excellent for temporary relief of unwanted hair especially on the sides of the face. This peach fuzz and “side burn” looking hair is planed off, leaving skin smooth and hair-free for one to three months. Our advanced lasers from Lumenis™ are the gold standard in laser hair removal. We are so confident in its exceptional capabilities that we invite you to come in and receive a complimentary treatment, up to 3″ sq. to see the results!